The way Andrea Ross was discovered is something of a fairy tale. When she was just 13, an agent suggested she make a tape and send it to Andrew Lloyd Webber, the phenomenally successful producer of "Cats," "Phantom" and "Evita." Now Andrea, who was performing in musicals at Boston's Wheelock Family Theater, seems on the verge of stardom. The tape "was just to karaoke backing tracks, it wasn't any big deal. I recorded it in a little studio — very tinny sounding," Andrea told CBS News correspondent Sheila MacVicar. Someone persuaded Lloyd Webber to listen to the tape. He did and liked what he heard, which led to a meeting, lunch and a recording contract. He invited Andrea to perform at his Sydmonton Arts Festival, where she wowed the audience and was then signed by Universal. "I ask you to give a hugely warm welcome to someone I think you're going to hear a lot more of, over the next, I would think, 50 years — Andrea Ross," Lloyd Webber said when he introduced her. "It's like a fairy tale when I think about it. I was doing shows in Boston and all of a sudden, now I'm working with my idol," Andrea said. "It's unbelievable." Her first CD is out this week. The title track is "Moon River," a song Ross said is special to her family. "It's a song that's been in the family for a while. It was my parents' wedding song and my grandfather and grandmother used to sing it a lot, so it's in my family," she said. 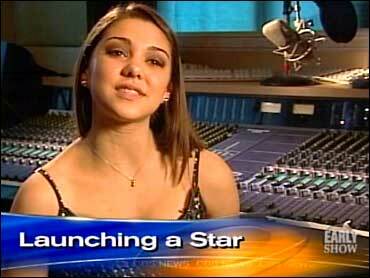 But that doesn't mean she comes from a musically talented brood. Andrea said her gift is unique. Andrea has no idea what the future looks like, but at 15 she may be launching a career that began when a man with a talent for talent listened to her sing.